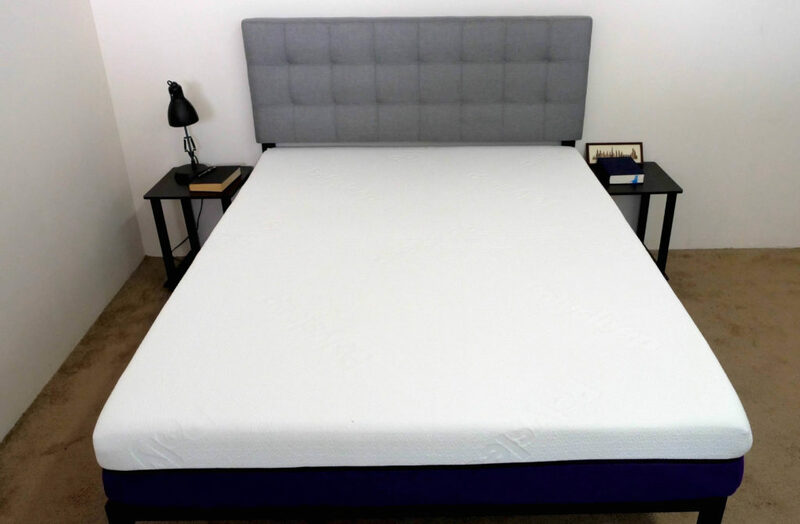 Polysleep Mattress Review - the Softest Canadian Mattress? Polysleep is a Canadian mattress retailer that designs, manufactures and assembles all of its beds in Montreal. This hometown pride transfers over to the brand’s flagship mattress, an all-foam model meticulously crafted to not only be comfortable, but also spill-proof and ventilated as well. Today, I’ll be putting this bed through my tried-and-true tests to figure out exactly how it feels and sleeps to see if it might just be the perfect mattress for you! 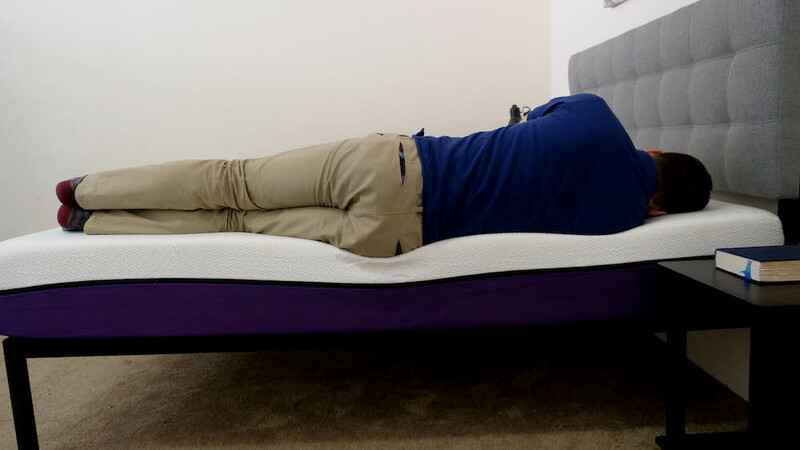 Continue reading below for my full review of the Polysleep mattress. Don’t have time to read it all? Click here to skip to the bottom and check out my review summary. The Polysleep mattress is built with four layers of both memory and high-density poly foam, stacking up for a total 10” of comfort. While this is a fairly typical construction for a bed-in-a-box, the inclusion of water-resistant materials in the cover and ventilation in the top comfort layer set this mattress apart from others on the market. Cover – The cover is made of a soft, stretchy material that’s liquid-repellant, a fun feature perfect for lazy breakfasts in bed. The sides are also made of mesh, which creates some nice breathability. Comfort Layer – The comfort layer is comprised of a hybrid memory foam, which produces some nice body contouring for immediate pressure relief. While it’s soft to the touch, it also responds quickly to pressure, so you’re not likely to feel stuck in the bed. I should note that this section is perforated with small holes to encourage air flow throughout the structure and is also designed to be anti-microbial. Edge Support – Below the comfort layer, you’ll find a thick section of high-density polyfoam edge support. This layer wraps around the structure and stabilizes the sides of the bed so you’ll be able to use the entire surface area of the mattress. Behind these side rails are two layers of foam, which I’ll talk about in more detail below. 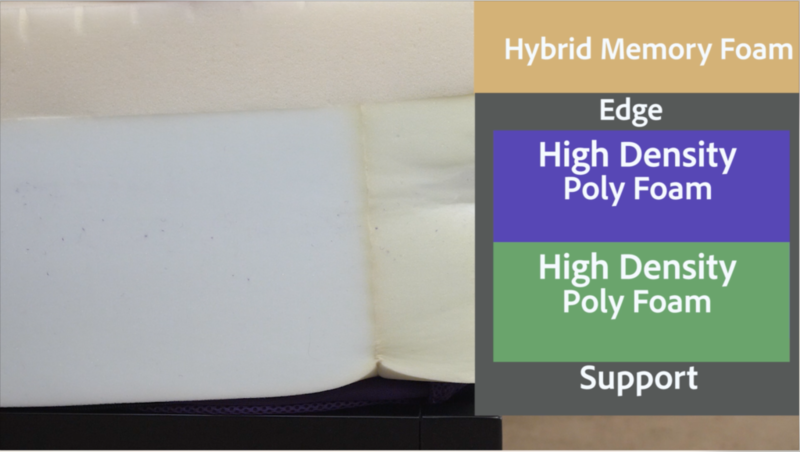 Transition Layer – The first of these layers is a section of high-density polyfoam, which transitions the sleeper from the soft material in the comfort layer into the firmer foam in the base. It’s also got some nice bounce, which helps lift the sleeper up and out of the bed. Foundation Layer – And finally, another layer of high-density polyfoam. This section functions as the base of the bed, anchoring the softer foams up top and giving the mattress its stability. After taking a look at the construction of the Polysleep, let’s chat about the firmness and feel. I started off by applying light hand pressure to the mattress and found that I was immediately interacting with the soft foam comfort layer. I could feel my hand really sinking into this section, noticing both its pressure relief and body contouring properties. As I pressed in further, I could detect the shift from the gentle top layer into the firmer base as I encountered the foam transition layer. Before moving on, I just wanted to note that people of different body types and sizes are going to feel firmness differently. 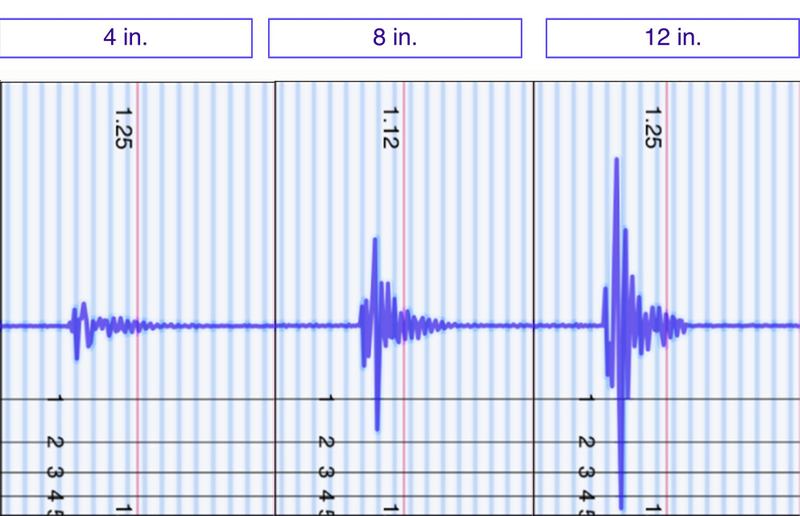 For this reason, I decided to bring in three other testers to help me figure out the overall firmness of the Polysleep. Each one of them gave the bed a spin and shared their individual firmness rating with me. I then compiled these on the graph below alongside my own. While feel is always going to be personal, our responses will hopefully give you a better sense of the firmness range you can expect from the mattress. 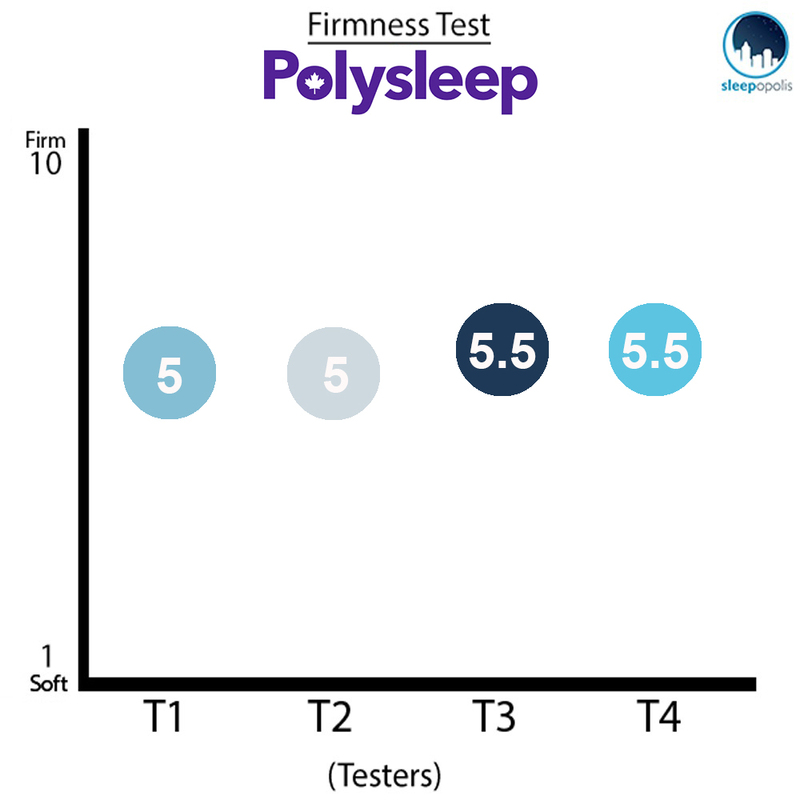 As you can see in the graph above, my testers were pretty much in agreement about the firmness of the Polysleep, giving it an average rating of 5.25. When compared to the industry standard of 6.5 for medium firmness, it’s clear that this mattress is pretty soft. I personally gave the bed a 5. 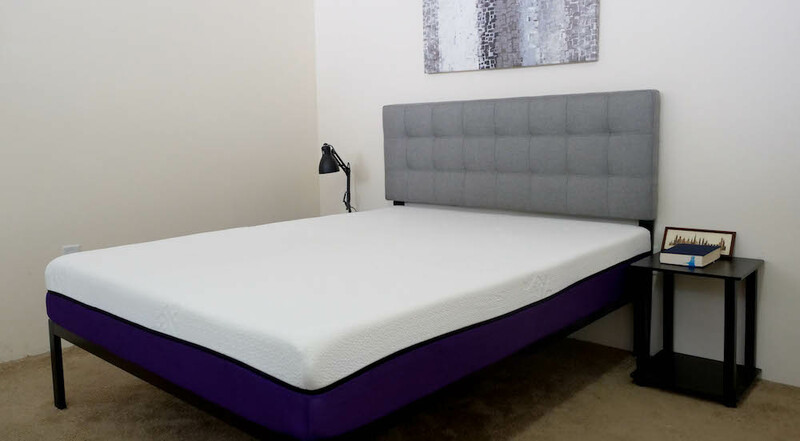 Though you’ll experience some pleasant contouring and pressure relief from the comfort layer, the edge support coupled with the bounce of the transition foam will help to prevent that stuck-in-the-bed feeling you sometimes get from all-foam models. That being said, I’d say this feel would be well-suited for side sleepers who generally prefer a softer mattress. Instead of just talking about the feel of the Polysleep to you, I wanted to give you a visual representation of where someone may feel pressure points form while lying on top of it. Back – I experienced a lot of quality pressure relief in this position and noticed that the hybrid memory foam did a wonderful job of filling in the space at my lower back. While I’d definitely say that this bed has a gentle feel, I never felt stuck in the mattress and found it easy to change positions. Side – Rolling onto my side, I continued to feel nice support and relief from the bed. As you’ll notice in the graphic above, there weren’t a lot of pressure points forming at my shoulders or hips, typical problem areas for side sleepers. Since the Polysleep is so soft, I’d say it would make a great option for those who doze primarily on their sides. 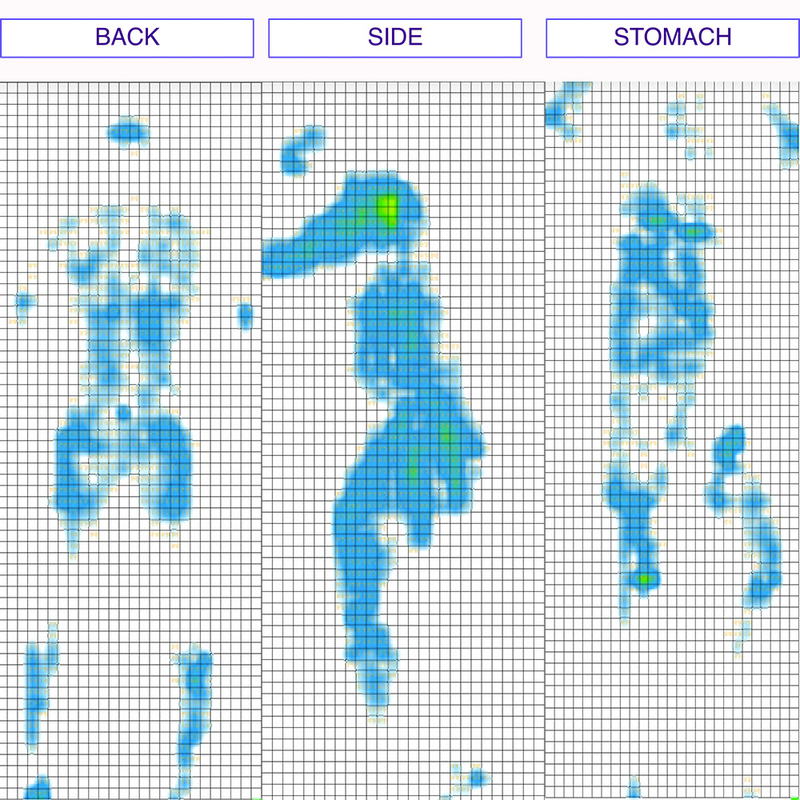 Stomach – Though this didn’t necessarily show up in the graphic, once I switched onto my stomach, I began to notice some pressure forming at my chest and hips. Stomach sleepers tend to prefer firmer mattresses as they help to keep their spines in a good alignment, so if you sleep strictly on your stomach, this bed may be too soft for you. Next up, we’re going to chat a bit about motion transfer, or the amount of movement that’s detectable from one side of the bed to the other. This test will be especially valuable for those of you who plan on sharing your bed with a partner, as it’ll let you know if you’re going to be wildly disturbed by their tossing and turning throughout the night. When compared to other mattresses on the market, these are pretty wonderful motion transfer results! The foam layers do a good job of dissipating motion throughout the structure, ensuring that you’re not likely to be too disturbed by your bed mate’s midnight movements. For this reason, I think this could make a great bed for couples. Interested in a Canadian mattress? Check out our top picks! Another thing to keep in mind when buying a new mattress is the amount of sinkage you’re likely to experience. These results are important because they’ll tell you if you’re going to feel like you’re sinking “into” the bed or lying “on top” of it. I’m not that surprised by these sinkage results as they’re consistent with most other all-foam beds I’ve reviewed. What they tell me is that you’re likely to sink into this mattress, but it won’t be so extreme as to leave you feeling stuck. I’d attribute this to the hybrid foam used in the comfort layer, which features some of the same properties of memory foam (pressure relief, contouring), but without the material’s slow response to pressure. And finally, let’s talk edge support. As with the motion transfer test we ran a few bullet points ago, this section will be particularly important for those planning to share their bed with a partner as it will clue you into whether or not you’re going to be able to use the entire surface area of the mattress. Lying on my back near the edge of the bed, I felt about as supported as I did in the center. Scooting closer to the side, I encountered the edge support side rails, which we chatted about in the construction portion of this review. This layer of high-density polyfoam made me feel secure and prevented any serious compression. 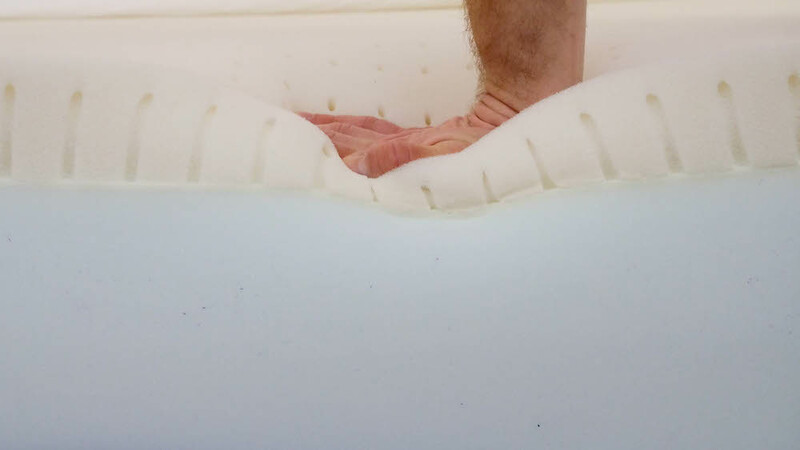 As you can see in the photo above, once I rolled onto my side experienced some compression through the comfort layer, but this is to be expected from an all-foam mattress. Again, the edge support worked to keep me feeling solid in this position. In this position, I wanted to simulate what it would feel like to be sitting on the bed in the morning when you’re lacing up your shoes and getting ready for the day. A lot of foam mattresses experience severe compression in this position, but the Polysleep actually held up very well. In fact, I’d say the great edge support is a big plus for this mattress. Shipping: Free, arrives compressed in a box. Just a reminder that this bed is made (and only available) in Canada. If you’re convinced the Polysleep is the right mattress for you, the size and pricing information for the mattress are below. Please note that these prices reflect standard pricing, but coupons are often available. 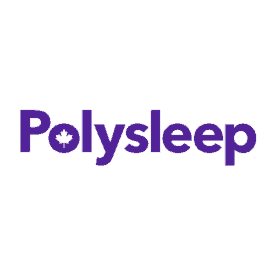 IS THE POLYSLEEP MATTRESS RIGHT FOR YOU? Now that we’ve taken a closer look at the Polysleep mattress, it’s time to discuss who it’d be a good fit for. 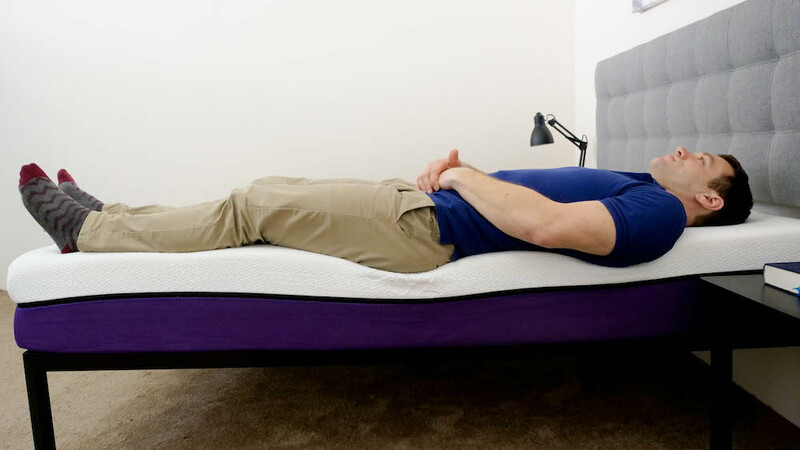 Couples – Considering how well the Polysleep did on the motion transfer and edge support tests, I’d say it would make a great bed for couples as you’ll be able to use the entire surface area of the mattress and won’t be too disturbed by movement across the structure. Side sleepers – The Polysleep is a pretty soft mattress, so could be a good fit for side sleepers who benefit most from the pressure relief of a gentle bed. Canadians – Given that this bed is entirely designed and produced in Canada, it would be a fantastic pick for anyone living in the country. Ready to buy the Polysleep? Get $70 off with code SLEEPOPOLIS70!